CS Tool Engineering of Cedar Springs, Mich., produces plastic injection and compression molds for the automotive industry. It also makes molds for a variety of consumer products. As business was ramping up for CS Tool, the company was in need of an equipment upgrade for its high-speed mold making operation. Because many of its products are custom components with no two pieces created alike, CS Tool needed to obtain agility to quickly switch jobs so as not to lose time during setups. Years before, CS Tool had purchased a Makino MCC2013 horizontal machining center to become more competitive in its handling of large dies and molds. This machine enabled the company to produce parts faster, reduce benching times dramatically and improve its lead-times. Because of success with this equipment and the fact that it was still as accurate as day one, CS Tool wanted to purchase another MCC2013 when its mold-making business began to grow. However, after SST, its local Makino distributor, spent time reviewing CS Tool’s operation, it suggested that CS Tool instead purchase the Makino a82 horizontal machining center. The a82 is typically a production machine tool most commonly used in automotive engine-block production. But CS Tool was able to see that mold components could be machined with the same mentality as used in production machining, even when building custom components where only two pieces are alike. In 2011, it purchased the a82 for its high-speed mold making processes. Soon after, CS Tool also purchased the FCS clamping system (Breyl) to further reduce setup time. It had seen the FCS system in action at similar shops and was impressed with the results. 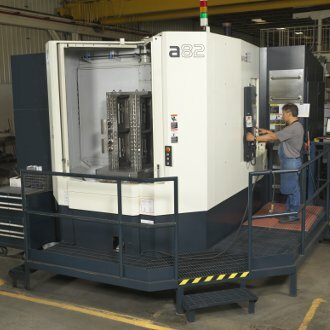 The a82 horizontal machining center gave CS Tool the agility to switch jobs quickly. The pallet changer enabled operators to load and unload work while another job was cutting—helping to improve agility and letting it pause and switch jobs quickly. With the full 360-degree B-axis, CS Tool is now able to machine all five sides and angled holes efficiently. By adding the FCS, the company was able to minimize setup time, improve utilization, reduce time required for pickups and achieve access to multiple sides of the part. Not only has this combination of the a82 and FCS brought accuracy to setups and reduced machining time in its mold making, but it has led to agility while giving the spindle the ability to be in contact with the work even more. In fact, cycle times have been decreased by 33 percent and setups have been reduced by 50 percent. Costs and lead-times have been driven down in this high-speed mold making operation as spotting and benching operations have been reduced and operators have obtained the ability to run two to four machines each.